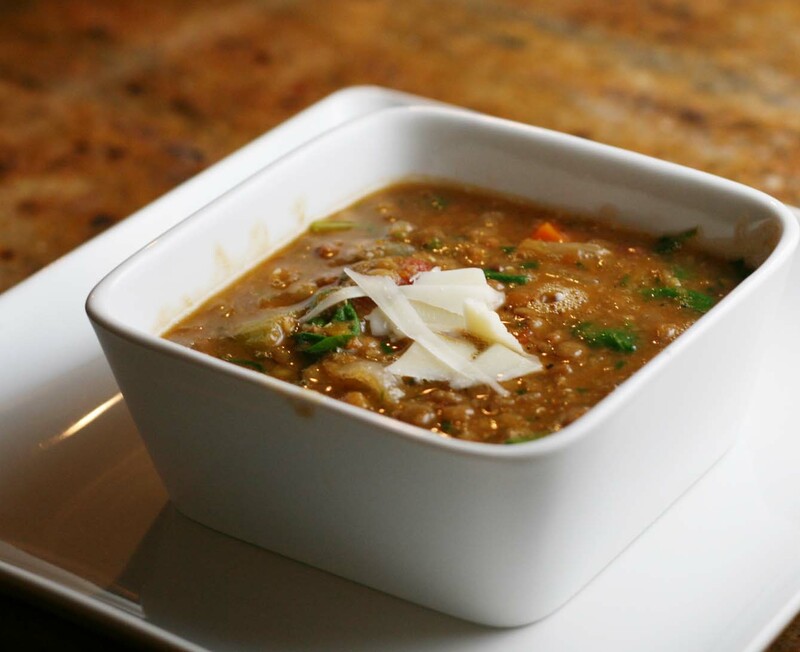 Rustic, earthy, warm that’s Lentil Soup. A good warmer on some serious cold Midwestern days. Mostly used in middle eastern and indian cooking, they are not the most coveted food but, somehow when cooked with all the good stuff like carrots, spinach, tomatoes and spices loaded in this soup, they turn in to a lovely little soup companion. 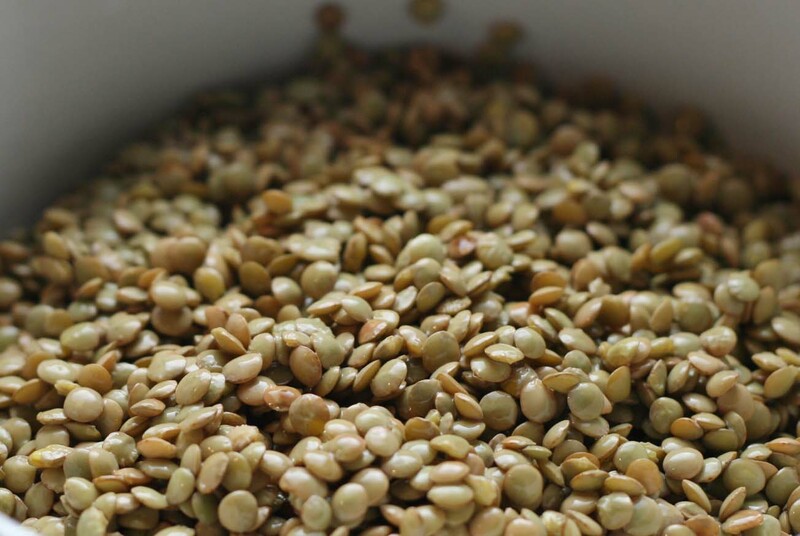 High in protein, fiber, folate/iron, and vitamin B , this legume is quite the superfood. Varieties of yellow, green, red and even black lentils are available. I usually turn to the easy to find green lentils. Cheap and easy to find. This cook likes that. This soup could easily be made vegetarian by omitting the bacon and using vegetable stock instead of chicken. Another great make a ton and freeze-it recipe. This makes about 12 cups of soup. 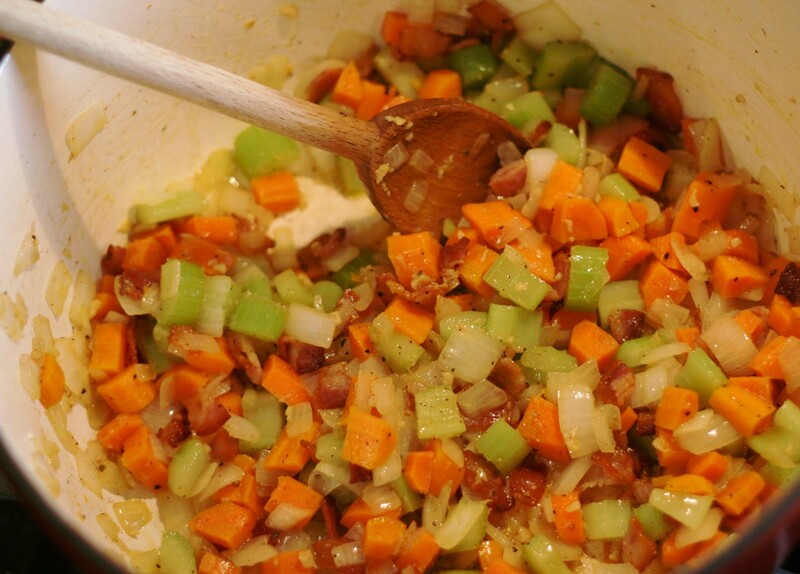 First off the bacon…it’s going to create not only some salt in the soup but some smoky bacon fat to cook the vegetables. mmmmmm. 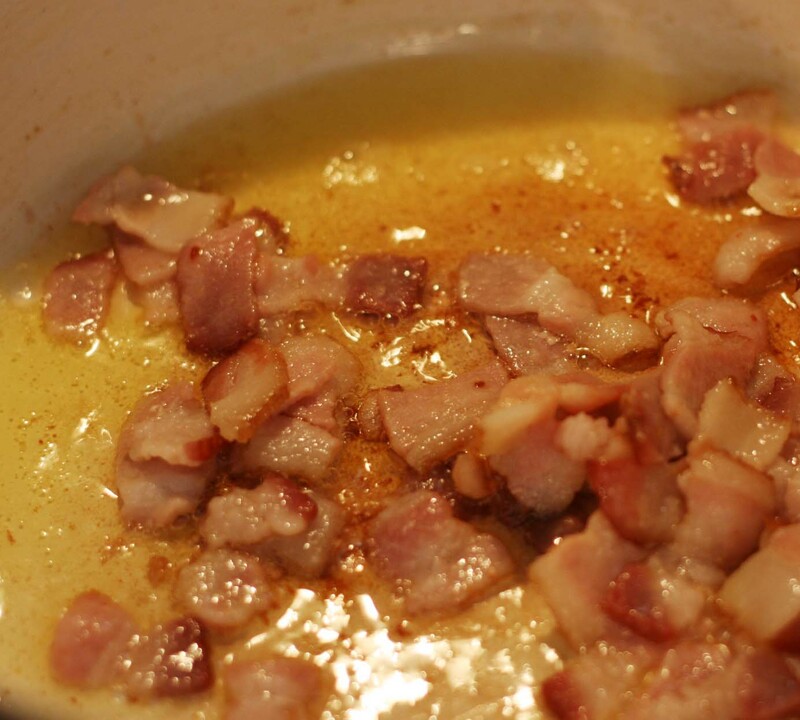 Once your bacon is browned, remove it from the pan (leave the oil/fat behind- isn’t that where it always ends up anyways?) and set aside. You’ll add it back later. Next, your veggies. 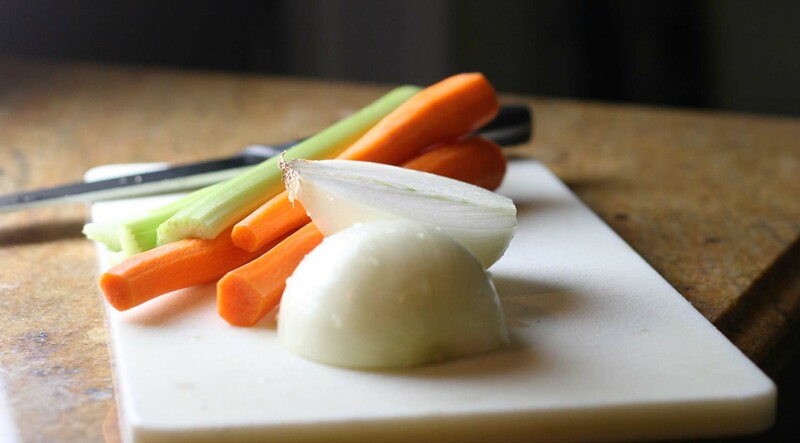 You’re doing about equal portions of the mirepoix trifecta- ohh, fancy french cooking term (mirepoix) for celery, carrots and onion used together. 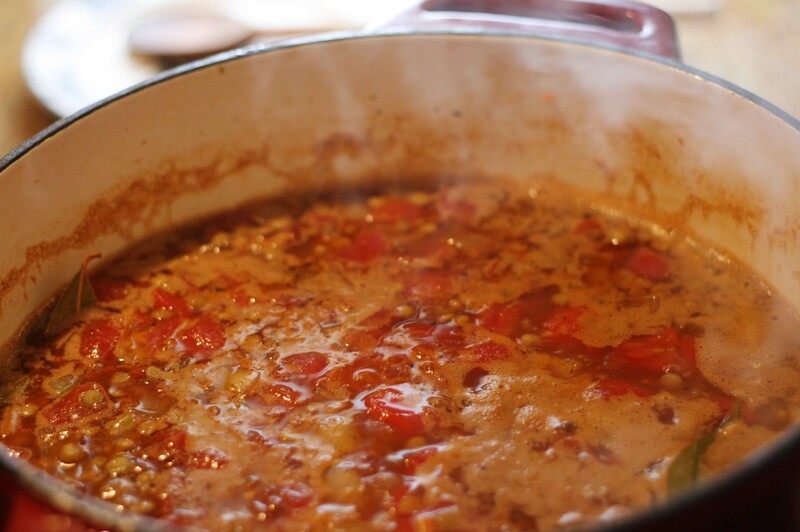 You see this combo used a lot for the base of soups and stews in french and cajun cooking. Keep them diced all about the same size so they all cook at the same rate. The trick I find works with particularly strong onions is to rinse them under cold water once you’ve made your half cut and are peeling them. It washes away some of the sulfide that makes your eyes water. Storing them in the refrigerator for a few hours before you’re going to use them sometimes helps too. No one wants to look puffy and forlorn eating lentil soup. 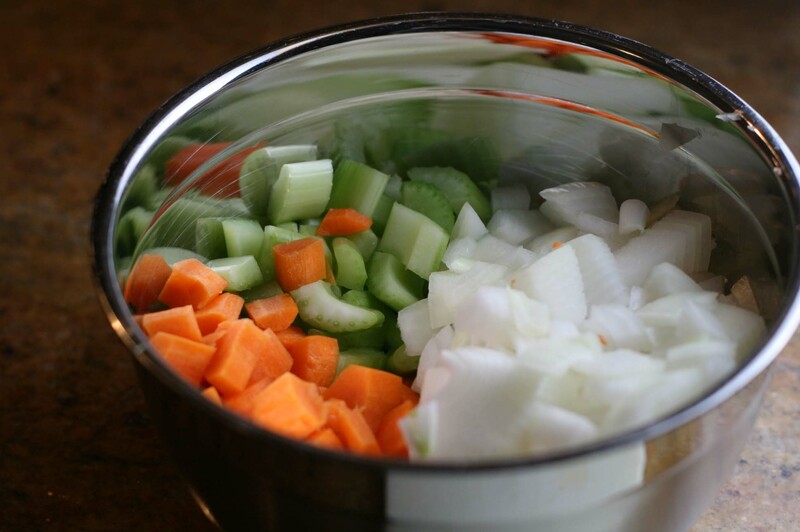 Mirepoix Trifecta cut all about the same size for even cooking. Saute those veggies and add the garlic in too. Season with salt and pepper lightly. Get them nice and soft and happy in the oil- about 7-10 minutes. Stir occasionally. Once they are softened add that bacon back in. We're cooking. We're sauteing. We're mirepoixing. As they soften, add the bacon back in. While you’re veggies are cooking, prep everything else. You will need to rinse and drain and pick over your dried green lentils. I know it seems cumbersome but nothing ruins a good bowl of soup like a broken tooth. There are, sometimes, little bits and stones in those dried bags of legumes. Just sift through after you’ve rinsed them. Rinse, Drain, Pick Over. No broken teeth over a bowl of soup, please. You will need your spices and tomato paste at hand. Get those ready! Now! Go! Run! Really, relax it’s just lentil soup it doesn’t get too fussy if it takes you a little longer. 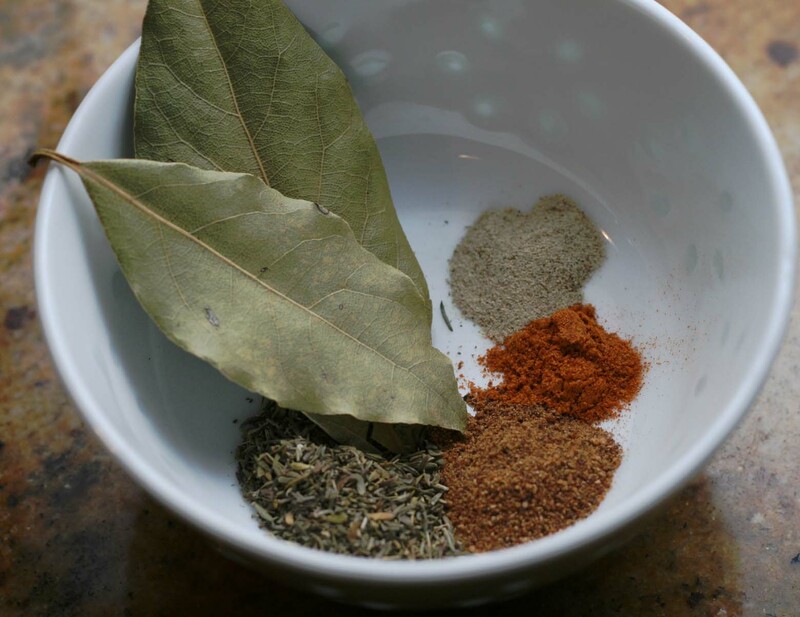 I fiddled with lots of combinations of spices and like this the best: white pepper, cayenne, nutmeg, bay leaf, brown sugar, thyme. Opps, forgot to put the brown sugar in the bowl. The rest are all there. Once the veggies are tender, stir in the spices and tomato paste. 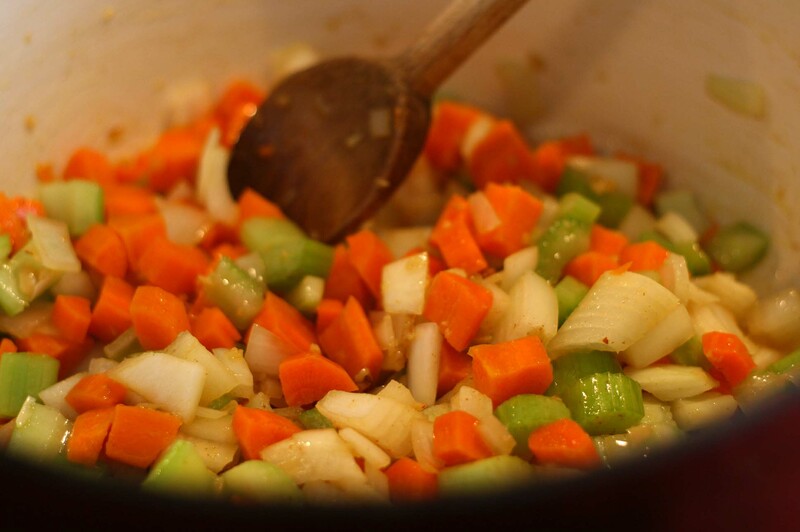 Stir for about a minute to coat the vegetables and release some of the aromatics of the spices. Next stir in the water, chicken broth, lentils, and diced tomatoes. I use lots of water instead of lots of chicken broth because otherwise this soup ends up really salty. Stir in water, chicken broth, lentils and tomatoes. Bring to a boil and then reduce heat. 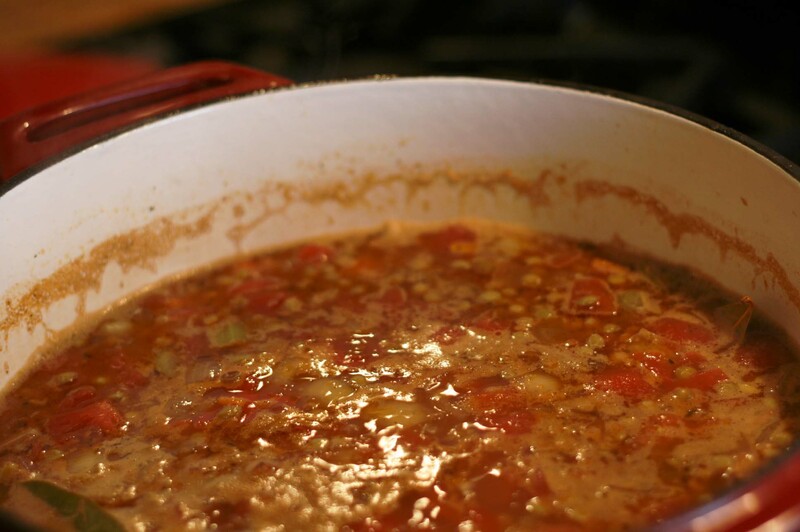 Simmer until lentils are tender about 35-45 minutes. Stir the soup occasionally. 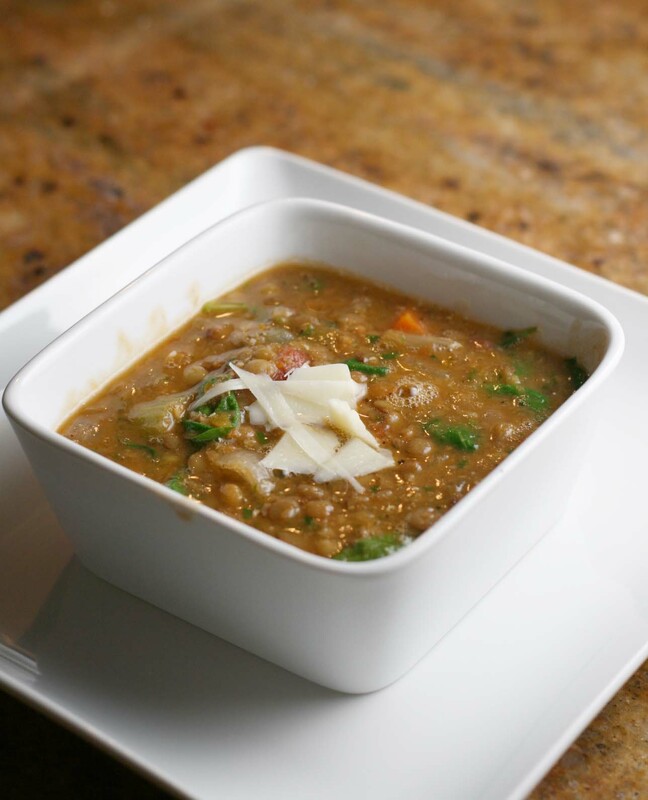 When the lentils are tender, stir in the balsamic vinegar, lemon juice and season to taste with salt and pepper. 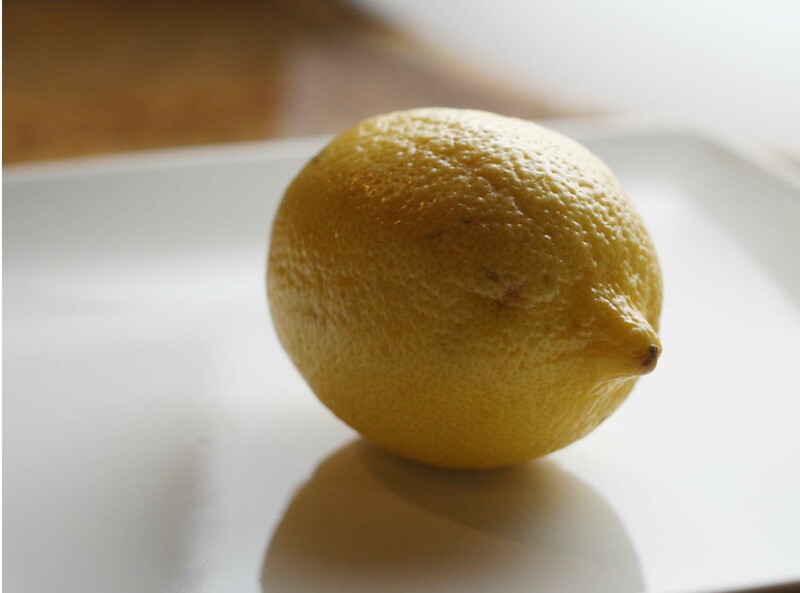 The lemon juice and vinegar pull out a lot of flavor in the soup in the end. Stir in the spinach after you puree, I find it’s easier to blend the soup without the spinach in there first. It will wilt quickly from the heat of the soup. Ladle in to bowls. Garnish with a little grated parmesan or asiago cheese and a swirl of olive oil. Up next on the blog front, pizza with a little memphis-style (pulled pork) attitude. Super easy pizza dough deconstructed. So easy why would you buy frozen?? 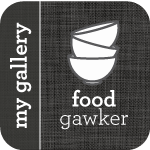 This entry was posted in Freezer Friendly, Soups, Uncategorized and tagged lentil soup, soup, vegetable. Bookmark the permalink. Thanks P! I will share.